It is so interesting to observe the themes that come up during writing workshops – at once unique to each individual, yet universal to us all. Fragility, struggling with identity on the prospect of retirement, feeling stuck. NOT having/wanting any more; the ‘non-striving’ ! “It was like, having lived in a house for years, finding a room you didn’t know was there”. Many comment on the uncertainty of putting pen to paper, and finding themselves surprised by what then ensues. I liked the analogy of a desire for the day in ‘writing out a map for going forwards’. – ‘May we have the courage to trust our unfolding’, in another’s neat observation. 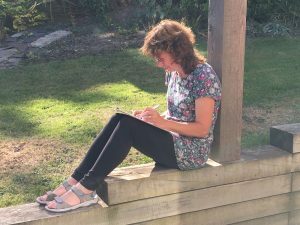 – The ‘pressure-versus-freedom’ of the freewriting exercise where the purpose is to write, without stopping, assessing or judging, for six whole minutes! The importance of Place, so often woven around home and early life, is never far away. This evocative poem from the day is reproduced with kind permission from Carol. Separated from us by creeks and marsh. Swiftly moving dots over grey dawn sea. Piercing the laughing chatter of jackdaws. The same yet also unfamiliar. The old field station swept away in a high tide. Through their shared love of the wild.